Among the legends surrounding the old Hollywood elite, there are few so eccentric (and verified) as the interior design choices of Barbra Streisand. Specifically, I’m talking about the mall she had built in her basement—with shops modeled to look like a quaint old-timey storefronts—to show off and store her many collections. “Instead of just storing my things in the basement, I can make a street of shops and display them,” she once told Harpers Bazaar (there are photos at the link and I beg you to look at them). She also discusses the building of the mall at length in her 2010 book My Passion for Design. Among the storefronts are a doll shop, a costume shop, and functioning candy store where she serves guests ice cream. On a recent visit to Streisand’s Malibu home, Lady Gaga and American Horror Story showrunner Ryan Murphy were invited down to the mall for frozen yogurt. “That was an evening that was jaw-dropping for me,” described Murphy at this past Saturday’s EW Fest. And I would read a book about that night—mostly because spending time in a basement mall that’s modeled to look like a turn-of-the-century street (that’s mysteriously lacking in horse manure and typhoid) alongside John Travolta and Barbra Streisand sounds like something out of a David Lynch movie or a particularly crazy fever dream. It’s hard to imagine and yet it’s the only thing I want to think about, possibly ever again. Barbra Streisand’s basement mall is so fascinating that it even inspired Buyer & Cellar, a 2013 hit play by Jonathan Tolins. Tolins first learned about the mall while reading My Passion for Design and—like the rest of us—couldn’t let it go. Buyer & Cellar, a one man show, earned its lone actor Michael Urie a Drama Desk Award for Outstanding Solo Performance and continues to be run across the country. 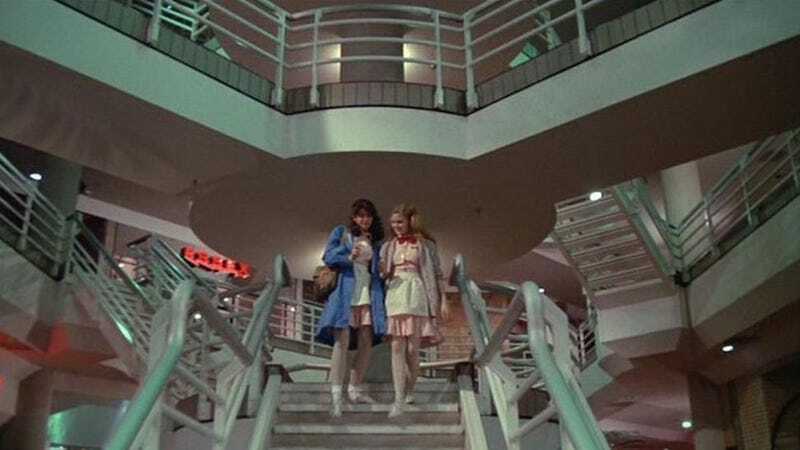 Basically, anyone who reads about Barbra’s basement mall—well, anyone who reads about Barbra’s basement mall and has a deep interest in the strange lizard people/illuminati who run Hollywood—becomes automatically obsessed with it. Good luck remembering anything else the next time you think or dream about Barbra Streisand. If you can put her basement mall to the back of your mind, you’re a stronger than me and Bab’s profile put together. Image via Fast Times at Ridgemont High/Universal Pictures.